It’s a genuine success story. In 2009, AAA-LUX, from an office in Eindhoven, the Netherlands, had a worldwide scoop. Within 8 years it gained a lead position in LED Sports Field Lighting. With the introduction of a 6th generation of LED floodlights, the company expects to further expand this position. Still, people in Eindhoven scratch their heads in amazement. They have taken a prominent position with football clubs in the English Premier League, the German Bundesliga, the Italian A-Series and within the Dutch football world so quickly. Not just limited to football, they have also taken this position within other professional sports, such as the French basketball champions team Asvel, the Roger Federer Tennis Arena or Belgium’s David Cup stadium. These are some examples of top sporting environments in which AAA-LUX is being applied. Accessible for the recreational sports. infrastructure – the type and positioning of the lighting columns – is comparable. In every town or village you can find multiple sports accommodations where people practice their sports. Realizing cost reduction in such places is a pure necessity. Sports clubs have to get their budget in order and because their lighting will on average be switched on 400 to 1000 hours a year, this reduction in costs plays a major role. Gen6: Keeping ahead of the game. In addition, AAA-LUX is introducing a brand-new operating system, under the name ‘Control Box 2.0’. “Simplicity in installation and use; that is what’s important. But we see many opportunities in offering user convenience. This is expressed through a touchscreen, or app (appropriately named ‘AAApp’), but especially in the way in which the complete lighting system in being monitored“, says Swennen. It is undeniable that AAA-LUX is being appreciated, this is evident when we look at their results. They deliver more than 200 projects per year on 5 different continents and these projects are becoming ever more large and striking. For example, a training complex for the FIFA World Cup or a huge golf course, with a quantity of floodlights with which you could easily illuminate five UEFA Champions League stadiums. Or ski slopes with a comparable size. “The scale is increasing enormously”, says a proud and smiling Swennen. The new building that was put into use last year is already bursting at the seams. Currently, possibilities to expand are being explored. 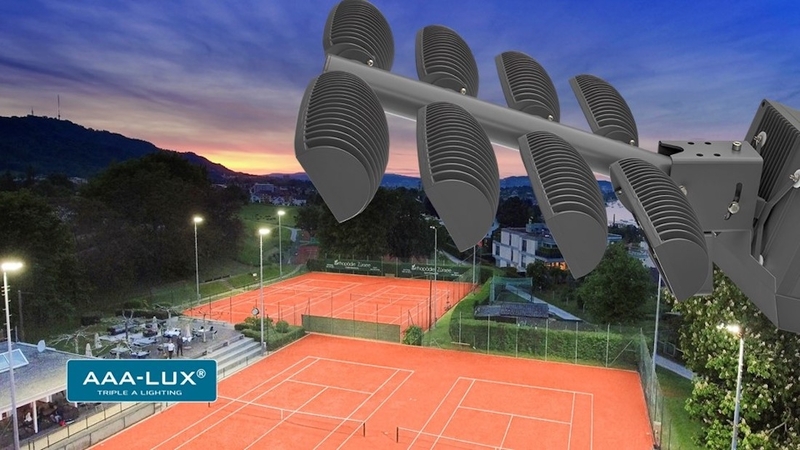 In addition to lighting sports fields, AAA-LUX also focuses on industrial lighting, also with high and large lighting columns in, for example, ports, airports and large parking lots.